Stone Hills belongs to Sheba. Hardly a day goes by when the scouts don’t pick up her spoor somewhere on the sanctuary, and frequently close to the house. Leopards are under major threat countrywide from over-exploitation by hunting and poaching, so Rich radio collared her some time ago in order to obtain crucially important data on her movements and habits. The battery in the collar has now run down, so we will be trying to recapture her and remove it when her latest cub becomes independent. 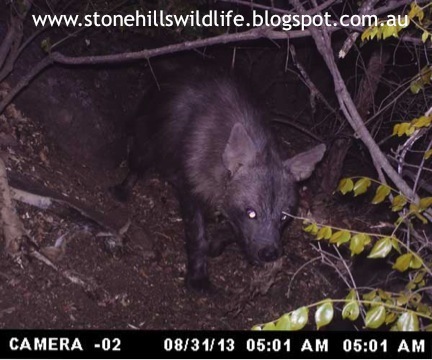 Whenever we locate one of her kills, we put up trail cameras to try and get as much information as possible. Sheba is a seriously efficient hunter, and an excellent mother. Her cub is about 6 months old and she is presently teaching the cub to hunt, focusing on easy prey. Everything is right about that - BUT it was Patience’s calf, and Sheba has followed up by killing Vicky’s calf two nights ago. Just because we knew and loved them is of course irrelevant (though it hurts like hell), but the real issue is that our kudu are some of the most vulnerable antelope in a drought, as you can see from the way they look in earlier pictures on the blog. We have now been feeding them up since June – and they have responded amazingly well. The calves were also looking good and the oldest was so tame that she would eat out of our hands. Very few of the youngsters make it, though, mostly falling prey to leopard or cheetah - just as our two did. It’s sad, but exactly as it should be – one dies so the other might live. Both species are vulnerable in different ways and both should be protected. There is no right or wrong involved, just the simple necessity of survival in a harsh world. 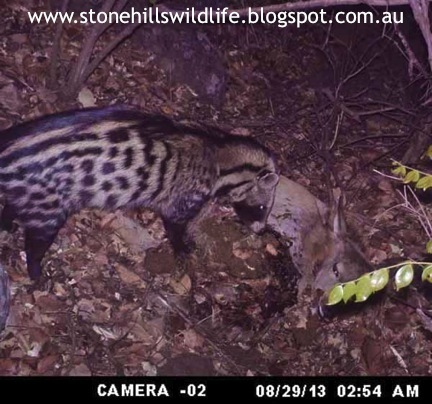 Civet - another noctural visitor, rarely seen. The day starts before 6 am, with a couple of mighty bangs on the bedroom window. The yellow-billed hornbills are hungry and that's their way of making sure we know it. The kudu and impala are already at the house - waiting for breakfast, as are the bushbuck, birds and dassies. Feeding in earnest has begun, and it's a team effort. 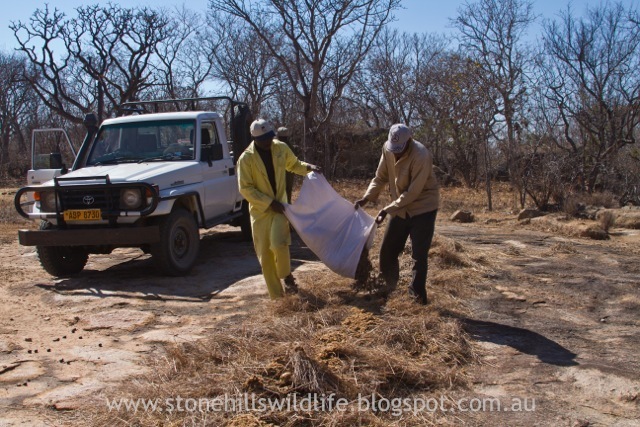 At 7.30 am, Head Scout Mafira, Mthabisi and Sean load up the tractor and do the drop offs at 10 different feeding stations throughout the sanctuary. This takes them about three hours. 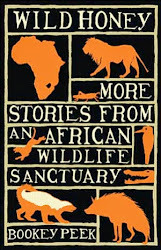 The next shift begins at 3.30pm when Rich feeds the warthog and giraffe; Khanye takes care of the kudu, and Big Fight spreads out the contents of six bags at a spot close to the river, which is primarily intended for the eland but is now being enjoyed by an assortment of zebra, impala, wildebeest and baboons. Meanwhile, I drive down to where the gemsbok are waiting, and having checked that the zebra aren't planning an ambush, leave their food on piles of cut grass, and then drive away quickly as they won't come in if we are close. 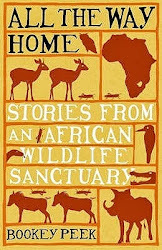 4 pm sees me at the kitchen giving Ted (yellow-spot dassie) his bowl of apple on my lap, feeding mealworms to the elephant shrews, and filling the drums outside our dining room window for the kudu - who are insatiable. By this time, the impala have come in again - and I ferry buckets of food to both them and the kudu until late at night. Rich drops off game blocks at different places - just to make sure that everyone is getting something, and has spent hours trying to induce our infuriating sable to come into feed. They are just as hungry as everyone else, but for some reason, show no interest in anything we offer them - even lucerne. They have never been fed before, so - we hope - it is only a matter of time. No new photos this time, but when Rich stops running, he'll start taking them again! I'm sure a number of you may have heard of me through my mother's books and some of you may have even seen me through my dad's documentary, but I'm the kid that wallows with warthogs (the youngest Peek). I want to extend a personal thank you to all of you for your donations and support - it's great to know that we have friends globally and that there are so many people that care for the environment and for a piece of Africa that many of you have not even seen. You are all heroes in your own right. Thank you. 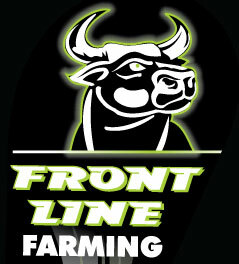 Centra and Front-Line Farming donated 13 bags of feed to us a couple of weeks ago. They have followed that up with a most amazing offer – 5 tonnes of beef survival mix per month for the next three months! They are very supportive of causes like ours – and Stone Hills is lucky enough to be the recipient of their generosity. 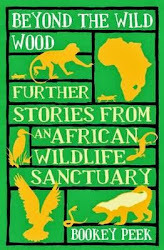 Zimbabwe certainly has its problems, but there are some wonderful people here who truly have the interests of wildlife at heart. The lengthy and expensive process of buying in and distributing feed all over the sanctuary is in progress. What a joy it is to see our animals crowding in for food that people from all over the world have helped us to provide. We would never have been able to do this without your help. We have now received 22 tonnes of mixed game blocks, lucerne, beef survival ration and cotton cake, which is being stored in our old manager’s cottage – out of reach of marauding baboons (until one of them figures out how to pick the locks). 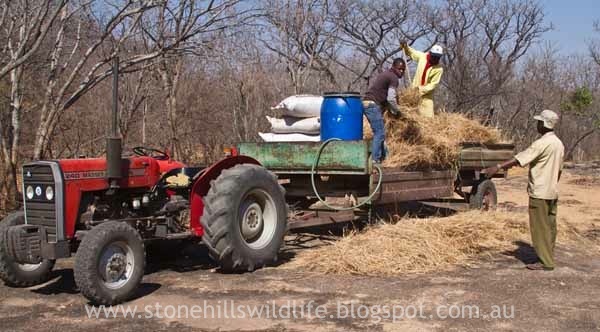 All of these contain as much as 30% protein - essential to enable the animals to digest dry matter, which has very little nutritive value, but is all that now remains on the veld. We are working on distributing 750kg a day at ten points around the sanctuary, using mostly on flat rocks to keep it out of the dust and avoid erosion. First, we put down a base of dry grass and molasses, and then spread the feed on top of it. Our eland will be calving shortly, so maintaining their condition is a priority. 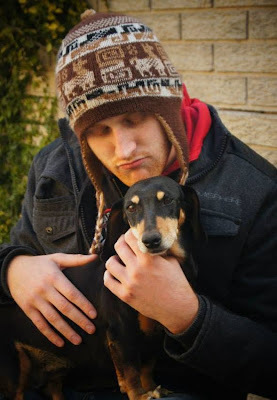 With the money already raised – over $11 thousand dollars (still can’t believe it!) - plus the very generous donations of feed from Centra/Front Line Farming and Mac Crawford, we are now able to reach animals in every part of the sanctuary. We need only another 15 tonnes to hit our target of 68 tonnes - something that seemed at first to be an impossible dream, but thanks to your generosity and overwhelming support, is now very nearly a reality. 15 tonnes will cost US$4,500 – and this will take us through to the end of November, by which time we are assured by those in the know that the life-giving rains we so desperately need will have arrived. 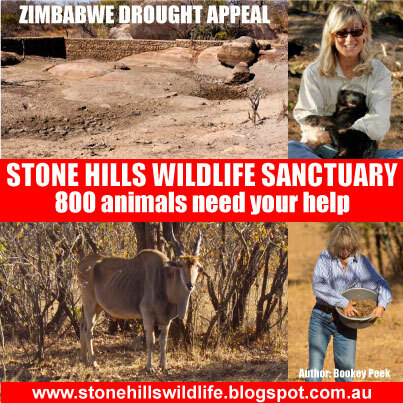 Please, if you can spare it, keep helping us to ensure that Stone Hills’ wildlife survives. Mac Crawford of Kabot's in Bulawayo mixes his own nutritious feed for his cattle and game. He's supplying us with 15 bags a week, absolutely free of charge. Thank you, Mac, for that and for everything else you do to help us and the farming community.